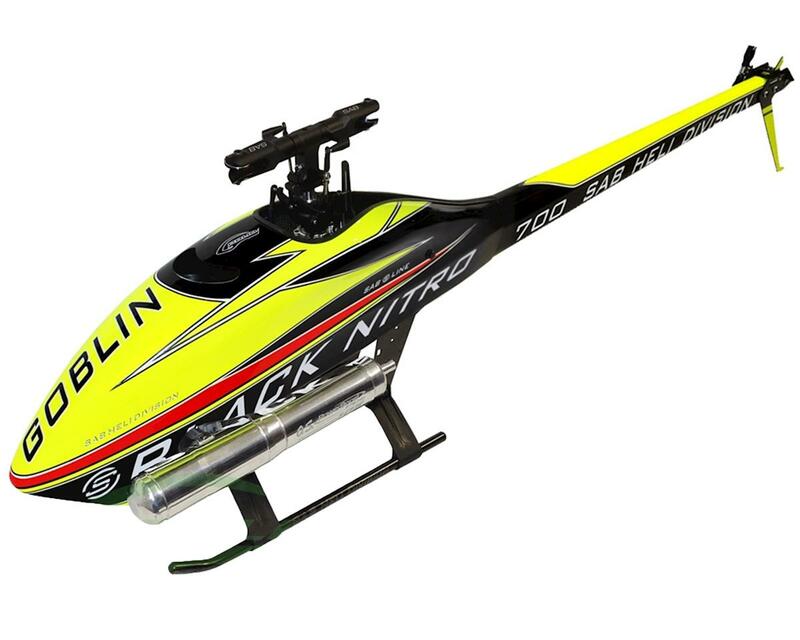 The Goblin Black Thunder Sport 700 from SAB Heli Division provides an incredible cost to performance package by offering a proven and robust platform that is the Goblin Black Thunder Nitro Helicopter! By manipulating some included parts within the kit, and additionally removing blades from the kit, SAB has been able to drive down the price of the Black Thunder Nitro Sport to an incredibly low offering never found before from SAB for a 700 class machine! Competition winning, proven and stylish design, and original design concepts are all still found at the heart of this helicopter. CNC Aluminum Flybarless Main Rotor System – Nothing but the Best: Taking full advantage of flybarless technology, the SAB Black Nitro is offered in a flybarless kit only, utilizing a bearing raced blade grip control system for the absolute in precision & control. Nothing was held back throughout this build, and you can expect nothing less when the Goblin takes flight.